Wildfires occur frequently on the Earth’s land surface, and biomass burning has important effects on both local and global ecosystems. Biomass burns inefficiently, releasing not only carbon dioxide and water, but also a number of other greenhouse gases that absorb outgoing longwave radiation and enhance the greenhouse effect. Aerosols are another by-product of inefficient combustion that can effect atmospheric processes. Burning mobilizes such nutrients as nitrogen, phosphorus, and sulfur in ash so that they become available for a new generation of plants, but it also carries them upward in smoke and as gases. Fire affects ecosystems by changing species composition and creating a patchy structure of diversity on the landscape. It can also stimulate runoff and soil erosion where a significant layer of vegetation is lost to fire. For these reasons and more, monitoring of fires by remote sensing is a topic of intense interest to global change researchers. Fires can be remotely sensed in several ways. Thermal imagers detect active fires as bright spots because they emit more heat energy than normal surfaces. However, fires may be obscured under clouds. Smoke plumes can also identify the location of fires but are hard to distinguish from clouds in some images. Burn scars can also be detected after the fire. 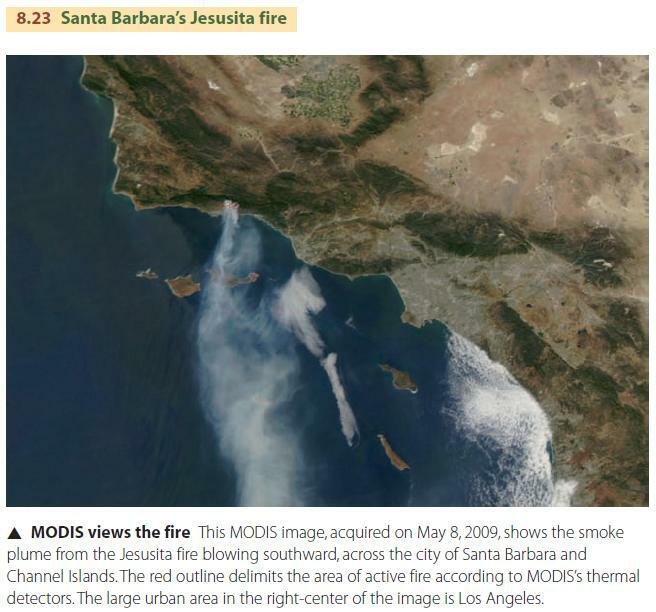 Figure 8.23, from May 8, 2009, shows the Jesusita fire, in the hills above Santa Barbara, California, as imaged by NASA’s MODIS instrument. Although not a large fire by California standards, this intense blaze destroyed 77 homes, damaged another 22 homes, and caused the evacuation of about 30,000 people. The photo shown above is an image of the burn scar from this fire, acquired on May 10 by the Advanced Land Imager aboard NASA’s Earth Observing-1 satellite platform. This imager uses a newer technology to produce multispectral images that are similar to those of Landsat. In the burned area, little vegetation remains outside of canyon bottoms.